Video capsule endoscopy (VCE) can provide yet another means of noninvasive diagnostics in evaluation of gastrointestinal tract disease in medium to large breed dogs. Minimally invasive diagnostics are an emerging and needed trend in both human and veterinary medicine. When evaluating acute or chronic gastrointestinal tract disease, endoscopic evaluation of the upper and lower gastrointestinal tract is the most common minimally invasive diagnostic currently utilized. Although endoscopy is an excellent diagnostic tool in the majority of cases, there are circumstances where this may not be the best route to pursue. In combination with ancillary diagnostics, video capsule endoscopy (VCE) can provide information integral to case management. Figure 1. 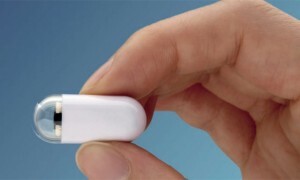 Photo of a video capsule. Patient selection for utilization of capsule endoscopy is based on suspected disease process, comorbidities, body weight and conformation, and consideration of the benefits with possible risks of the procedure. If deemed an ideal candidate, a video endoscopy capsule unit is administered in the hospital after a twenty-four hour fast. The patient is then required to fast for an additional eight hours after administration. The VCE unit has four cameras that provide a 360° view of the entire gastrointestinal tract in 80-85% of cases. After administration, the patient can be kept in the hospital or sent home while awaiting passage of the capsule through the gastrointestinal tract and subsequent retrieval from the stool. After retrieval, the capsule images are downloaded and evaluated by a gastroenterologist, the nonreusable capsule is discarded, and a patient care plan is further outlined. Capsule endoscopy may be beneficial in patients with obscure gastrointestinal tract bleeding, detection of small bowel tumors not accessible via traditional endoscopy, identification of NSAID side effects, and patients not deemed suitable for general anesthesia secondary to comorbidities. Obscure gastrointestinal bleeding is perhaps one of the biggest indications for usage of capsule endoscopy. 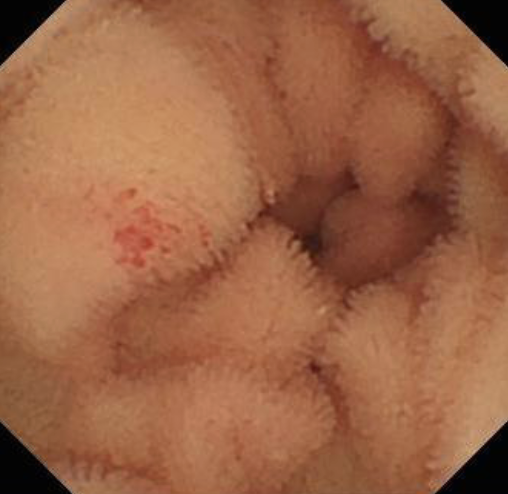 This condition can be defined as a persistent bleeding of unknown origin after an upper and lower gastrointestinal endoscopy fail to identify the source of bleeding. Clinical signs with obscure gastrointestinal bleeding can include persistent melena, hematemesis, hematochezia, and iron deficiency anemia. Although capsule endoscopy can be beneficial in many dogs, it is contraindicated in those that have suspected gastrointestinal obstruction, fistulas, strictures, swallowing disorders, cardiac devices such as a pacemaker, or pregnancy. Complications are rare but can include capsule retention requiring endoscopic removal or lack of relay of viable data, obstruction, and perforation. Currently, the capsules lack the ability to acquire biopsies. However, this limitation is currently under research and may be available in the near future. Although relatively new in veterinary medicine, capsule endoscopy as a whole can be a huge asset when utilized in the appropriate patient. We would be happy to discuss whether Video Capsule Endoscopy (VCE) is a viable option in your patients.